Since the recognition that came with the Flying Lure, Alex Langer has branched out into his other passion (than fishing) - radio. Alex is now President and Chairman of Langer Broadcasting Group, LLC in the greater Boston area which owns and operates radio stations in major markets. Alex continues come up with brand new ideas to catch fish, like his latest creation, the RotoTail, which he calls "the plastic worm of the future". He sold the Flying Lure to National Media Corporation, the infomercial company. 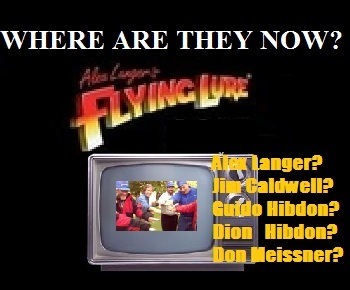 After about a decade in the wilderness, Alex bought the Flying Lure back. So many people were asking for the Flying Lure, he simply had no choice in the matter. Alex hosts one of the largest national outdoor radio shows in America, Outdoors This Week, broadcast on the IRN/USA Radio Network. What most people probably don't realize is that Alex was doing his radio show first -- long before he was on TV. Once in a while, Alex is still recognized by Flying Lure fans in a restaurant or on a boat ramp launching one of his classic Rangers. Jim Caldwell discovered infomercials and direct response TV in the spring of �, hosted a few in the fall of � and �, executive produced 35 infomercials for Kevin Harrington in � (he抯 now on ABC抯 Shark Tank), started Future Thunder Productions, Inc. in �, and hit his first homerun in the fall of � with none other than his good friend Alex's Flying Lure!! Many of today抯 direct response luminaries got their start in the world of 'DRTV' with Jim during those frontier days working with Kevin. Jim went on to win over a dozen ERA (Electronic Retailing Association) and other advertising awards (eg. Ad Age抯 Top 5 Commercials of Any Kind for the Flying Lure) as writer, director, producer and host including Infomercial of the Year in � for The Roto Zip Spiral Saw. According to one industry monitoring service, Jim has hosted more infomercials than anyone else, something like 96! He was just inducted into Response TV Magazine抯 Hall of Fame as a member of the inaugural class! Jim always remembers how cool it was to go out into the middle of no where, filming with Alex and some well known fisherman, and being able to see in real time how effective the Flying Lure was in helping a fisherman catch fish that were hiding under cover and brush "where only the Flying Lure could go!" Since the Flying Lure infomercial, Dion amazingly went on to win the Bassmaster Classic, just like his dad, Guido. They are now the only father and son team to have both won the World Series of bass fishing. Dion's two sons are also accomplished bass anglers who have their sights set on the Classic. The Hibdons still travel in a caravan of trucks, boats and trailers all brilliantly managed by Guido's lovely wife, Stella. The biggest Flying Lure believer of all-time and its most proficient user is Don Meissner. Don had recently been fishing in upstate New York with a group of notable people and the Flying Lure was the only thing actually catching fish. He always said, before anyone else even discovered it, 揥hen nothing else is working, the Flying Lure is the one lure I can count on.� Don built his reputation over 20 years as the host of a public television program called, Rod & Reel Streamside. On Streamside, Don would venture out to lakes, ponds, and streams with the goal of catching lots of game fish as well as providing a ton of educational information on fishing to his viewing audience. Over the many years Don hosted this PBS television program, he traveled all over the United States and Canada. Viewed by millions, his program was extremely popular nationwide. Today, Don Meissner is involved in a new venture. He's developing an online-only video program called, 揊ishing with Don Meissner.� Don explores new places to fish and shares his passion for angling. Don also is chief spokesman for upstate New York's fishing opportunities. "Fishcap", or Fishing Capital of the World, as the initiative is called, refers to the St. Lawrence River valley. The objective of Fishcap is to tell as many people as possible about the world-class fishing in upstate New York as opposed to what most people think of when you mention New York -- Broadway. Don is still as avid a Flying Lure user as ever, with the small problem of the lure being off the market for the last decade. Don has had to scrounge, scrape and borrow any Flying Lure he could find anywhere. That included local bait shops in upstate New York that still had Flying Lures "out back", from before TV, over 20 years ago.